Zelda has been my “go to” rehab horse. Although she’s big (it’s a long way to the ground when I dismount), she’s steady and, let’s face it: her default speed is slow. “Do we have to trot?” she’ll ask me when we work in the ring. “Again?” Left to her own devices, ambling along for a half hour is a perfect choice. Freedom, on the other hand, has no idea that he’s 20. I rode him once a few weeks ago and all he wanted to do was canter. I wasn’t ready for that, so I put him on hold. Since then I’ve not been riding much but I’ve been diligent about my PT and I’ve been walking a lot. When I was in San Francisco the week before last I surprised my self by walking as much as five miles a day (including some gigantic hills). While that didn’t always make my recovering ankle happy with me, I do feel a lot stronger. And he needs a job. While most horses are happy to mosey around their paddock, Freedom is always happier and more relaxed if he gets to DO something. This photo doesn’t do the flowers justice. The yellow petals glowed in the late afternoon sun. So today, when I arranged to ride with Lindsay, I decided it was Freedom’s turn. He hates to be left behind. When we take Zelda and Curly out, he will run the fence line calling for them. Sometimes for the entire time we’re gone. Yes, it means that he gets exercised too, but I hate for him to get so upset. Given that it was 80 degrees this evening and we had Curly to keep him steady, we went for a walk through the neighboring trails. It was a gorgeous evening with a nice breeze that kept the bugs at bay. Freedom was perfect. 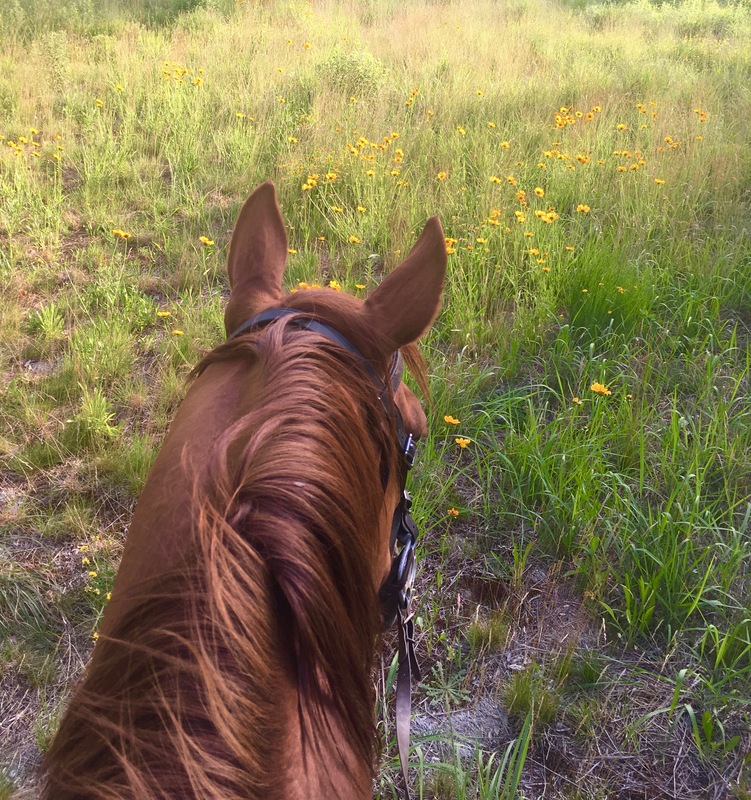 I think he enjoyed getting off property as much as I did (I am not yet riding the trails alone, so most of my riding is in the ring). All we did was walk. Once Freedom gets revved up, it’s hard to get him down again, and Curly, who was recently diagnosed with Cushings, has too much coat on her right now for a real workout. But it was a real treat. The grass is lush and green, the spring flowers are popping up everywhere, and the breeze carried the subtle scent of spring. What could be better?